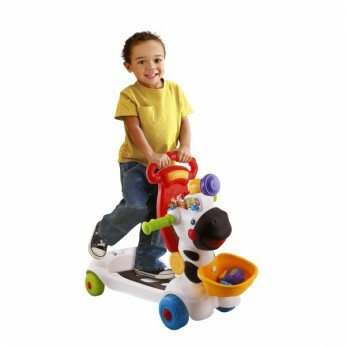 Combine learning with fun as your child becomes a wildlife explorer on this 3 in 1 zebra scooter. With three interactive modes of play the electronic learning panel teaches colours, animals and habitats with encouraging phrases and flashing lights that will keep them engaged for hours. The 3 in 1 grow-with-baby design means they can push, sit and ride or scoot around to rewarding voices, melodies and songs that will really get them moving! Combine learning with fun as your child becomes a wildlife explorer on this 3 in 1 zebra scooter. With three interactive modes of play the electronic learning panel teaches colours, animals and habitats with encouraging phrases and flashing lights that will keep them engaged for hours. The 3 in 1 grow-with-baby design means they can push, sit and ride or scoot around to rewarding voices, melodies and songs that will really get them moving. 3-in-1 Grow-with-baby design; Electronic panel on top for interactive teaching. Encouraging phrases keep child playing actively. Rewarding voices for encouraing play; Lights, animal and habitat sounds and phrases, melodies and songs. Batteries required: 2 x AA (included); For ages 18 months and over; EAN: 3417761126035. * 3974573 43.99. This toy costs approximately £47.99 (for the latest and best prices make sure you check our retailer list for the VTech Baby 3-in-1 Zebra Scooter above). In our review of VTech Baby 3-in-1 Zebra Scooter we classed it as being suitable for ages 1 to 3 years but recommend you check the manufacturer specific advice before purchasing.